Ergonomic Chairs provide back support. Series MM Upholstered Chairs feature tall, wide backrest that conforms to natural curves of spine and provides lumbar support. Seat has waterfall front to aid in circulation and reduce strain on lower legs. 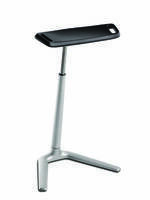 Backrest's plastic panel and seat's internal bumperguard provide resistance to wear. Chairs are adjustable to meet individual needs and adapt to multiple users on shift operations. BioFit® Engineered Products introduces MM Series heavy-duty ergonomic chairs for added back support, greater seating comfort and durability in assembly, material handling and other industrial applications. These upholstered chairs feature a taller and wider backrest that conforms to the natural curves of the spine and provides lumbar support. The generous-size seat has a waterfall front for improved circulation and reduced strain on the lower legs. The backrest's plastic panel and the seat's internal bumperguard provide added resistance to wear. 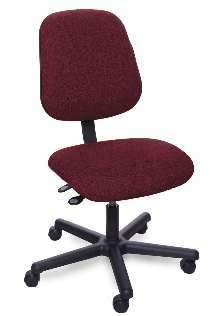 MM Series chairs offer easy adjustability to meet individual needs and adapt to multiple users on shift operations. Standard equipment includes controls to adjust seat height and backrest height and tilt. 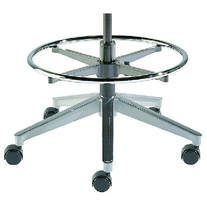 Various seat-height adjustment ranges are available to accommodate work at bench and/or desk heights.